Berlin-based “professional in-betweener” Sissel Tolaas was born in Norway and studied mathematics, chemical science, languages and visual art at universities in Oslo, Warsaw, Moscow, St. Petersburg and Oxford. Since 1990 she has focused her work on smell and communication, moving within disciplines of science, art, academia and industry. In 2004, Tolaas established the Smell RE_searchLab in Berlin with funding from International Flavors and Fragrances (IFF). 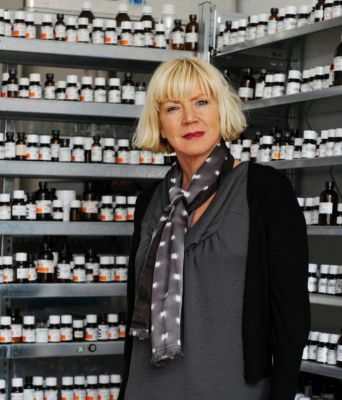 She has performed smell studies for companies and institutions including BBC London; Sony Computer Science Laboratory, in Paris; Max Planck Institute; Deutsche Bank; Louis Vuitton; Estee Lauder; KPMG; Sony BMG; SHOWstudio; Mercedes Benz; Adidas; the Rockefeller Foundation; Johnson & Johnson; 2008 Summer Olympics in Beijing; Liverpool University; Parsons The New School For Design; Harvard University; Stanford University; University of Michigan; Art Center College of Design, in Pasadena; NASA; IEEE; and MIT. Tolaas often participates in international colloquiums and conferences; recently she became a founding member of the International Sleep Science and Technology Association. Her work has won international recognition and prizes, including a 2009 Rouse Visiting Artist appointment at Harvard GSD; a 2010 Honorable Mention in the category of Hybrid Art at Prix Ars Electronica, in Linz, Austria; and a 2010 collaborative residency at Harvard Medical School awarded by Synthetic Aesthetics, a research project jointly run by the University of Edinburgh and Stanford University. Her projects have been featured at the Museum of Modern Art, in New York; the San Francisco Museum of Modern Art; Fondation Cartier, in Paris; Hamburger Bahnhof, in Berlin; Tate Gallery, in Liverpool; the National Art Museum of China, in Beijing; the Venice Biennale; and documenta 13.